Osaka's tourism has been hit hard as last week's typhoon ripped through western Japan causing a partial closure and reduced flights at Kansai International Airport. 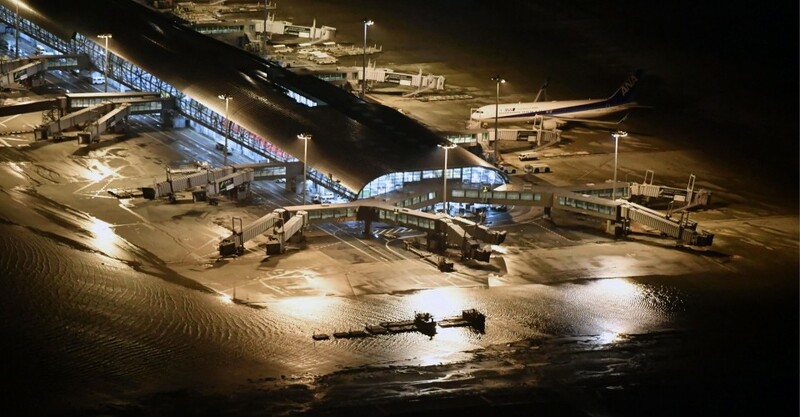 Typhoon Jebi caused one runway at Japan's third-largest airport to be flooded, making one of its two terminals inoperable, while the sole bridge linking the airport on a man-made island in Osaka Bay to the mainland was damaged as a tanker ripped from its mooring smashed into it. Although both domestic and international flights have partially resumed, only 10 percent of international flights were operating as of Tuesday. While cleanup efforts are under way in the flooded terminal, its escalators and elevators were not working and electricity was cut off in some areas. 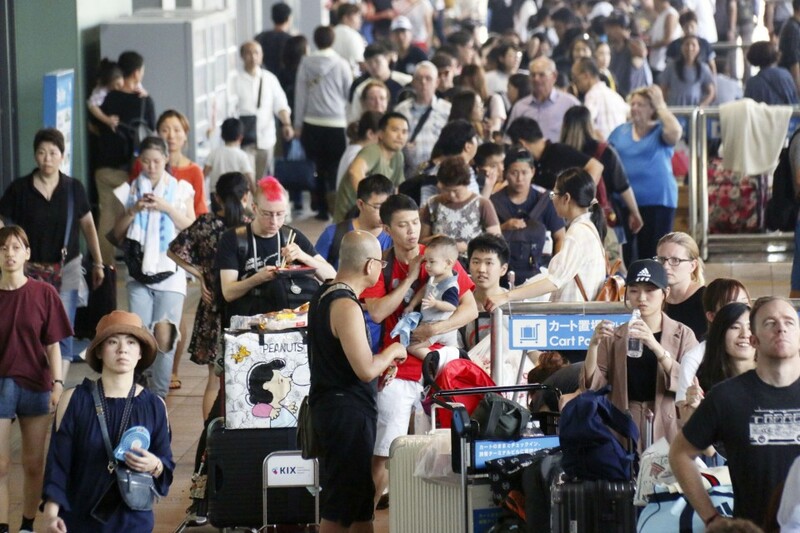 There were some signs of recovery at the other terminal as restaurants and convenience stores started to re-open, but the usual mass of foreign passengers -- mostly Chinese, Koreans and South Asians -- are gone. Many seats remain empty in the lobby. "The number of foreign visitors is low and passengers are few. We don't think we will recover easily," said a public relations person for Peach Aviation Ltd., a budget airline with an office at the terminal. "We think the typhoon made an extremely negative impression on tourists so we need to emphasize the safety aspect." Osaka's tourism industry is worried about the sudden reduction in visitors to the city. The number of tourists to Osaka Castle has almost been cut by half compared with last year due to the typhoon. Only 4,000 people visited on the first Saturday after the typhoon, and about 4,100 on Sunday compared with a daily average of 7,600 in fiscal 2017. The figure had translated into 2.75 million visitors that year, composed equally of Japanese and foreign tourists. Hotels were also hit hard by the typhoon and there was prolonged traffic disruption. "Many foreign tourist groups have canceled their reservations and there are few new reservations," said one hotel manager, where 40 to 50 percent of its customers are foreigners. "Reservations had already gone down after this June's earthquake. Recovery has become even more difficult now," the person said, referring to a powerful earthquake that hit the Osaka area on June 18. A drugstore manager in the city said he felt that foreign customers had dropped by half, adding, "I worry about how much my profits have decreased." Osaka authorities had hoped that an increase in foreign tourism would spur the city's growth. Last year, more than 11 million foreign visitors spent 1.18 trillion yen ($10.6 billion) in the city. "Tourism and industries have been hit hard," Osaka Gov. Ichiro Matsui said last Friday at the city's growth strategy session. "We must do our utmost to maintain a level of 11 million foreign tourists which is linked to Osaka's growth." An official for Osaka's tourism bureau said, "If the reduction in foreign flights continues, the negative impact on the city will rise. It's important to spread the message that Osaka is safe and fine." The central government is also participating in the recovery effort, especially after the typhoon in western Japan had been followed a few days later by a devastating earthquake in Hokkaido. Faced with two successive natural disasters at popular tourist spots, tourist minister Keiichi Ishii said at a press conference Tuesday he is "concerned" the negative impact of the natural disasters on foreign visitors "would spread." "In order to minimize the impact as much as possible, we will reconstruct the Kansai International Airport's runway and make an effort to salvage the reputational cost." He also said the tourism ministry's overseas bureau will send accurate information abroad to reassure travelers. Ishii also indicated that rail service on the bridge connecting the airport and the mainland may start working within a month, and not in early October as had been expected. The tanker that crashed into the bridge during the typhoon smashed a road lane into the rail line, making it inaccessible to trains. A crane is expected to pull up the crushed lane by Friday. Ishii also said the southern part of the disabled terminal will start operating as flights, including international ones, will be temporarily diverted to different airports. Forty flights will be diverted to Itami airport, straddling Osaka and Hyogo prefectures, and 30 to Kobe Airport. But it remains unknown when Kansai International Airport will recover completely.